Imam Muhammad Bin Saud Islamic University, Riyadh, Saudi Arabia has approved scholarships for 15 students of International Islamic University Islamabad(IIUI) who would acquire free education in various departments of Imam Muhammad Bin Saud Islamic University. This step is taken in view of an MoU which was signed between both universities with the efforts of President IIUI Dr. Ahmed Yousif Al-Draiweesh. President IIUI while lauding the cooperation of KSA government and Imam Muhammad Bin Saud Islamic University has thanked both for mutual cooperation. He reiterated his resolve that IIUI would remain committed for cooperation with universities of Islamic world. Last year, 200 IIUI students were provided scholarships by various universities of Saudi Arabia, those students are getting facilities such as free education and residence under the said scholarships. International Islamic University Islamabad (IIUI) has decided to conduct a special entry test for the applicants who could not appear for entry test held as per schedule/revised schedule. It was decided here in a meeting held at new campus of the varsity which was chaired by Acting President IIUI Dr. Tahir Hakeem. The meeting was also attended by D.G (AF & P) Gulzar Ahmed Khwaja, Deans of faculties and Director Finance. It was decided that a special test would be conducted on Monday September, 01, 2014 at 1230 pm for all left over applicants for all programs of all faculties except Faculty of Engineering and Technology (FET) who has already provided such opportunity. Participants also discussed commencement of classes for fall semester 2014 and agreed that classes would start from September 08 while new batches of FET would commence by September 15 2014. Male applicants can call on +92-51-9019567, 9019749 while female applicants can call on +92-51-9019327, 9019324 for further information. President, International Islamic University Islamabad (IIUI) Dr. Ahmed Yousif Al-Draiweesh’s book “peaceful co-existence with non-Muslims” has been published by Islamic Research Institute (IRI) of the university. The book containing 114 pages has been translated from Arabic to English by Dr. Inam ul Haq Ghazi, Incharge Department of Translation and Interpretation IIUI. 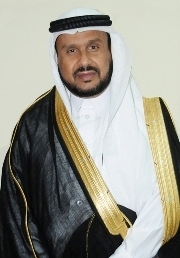 In the book, Dr. Al-Draiweesh has discussed topics such as freedom of faith to non-Muslims, equality, economic justice and propaganda against Islam. It’s worth mentioning that Dr. Al-Draiweesh has written more than 50 books and research papers on various important topics including comparative jurisprudence, Islamic economics, human rights and religious extremism. He has been recently nominated for Tamgha-e- Imtiaz by the government of Pakistan for his untiring efforts in the field of education especially comparative jurisprudence. 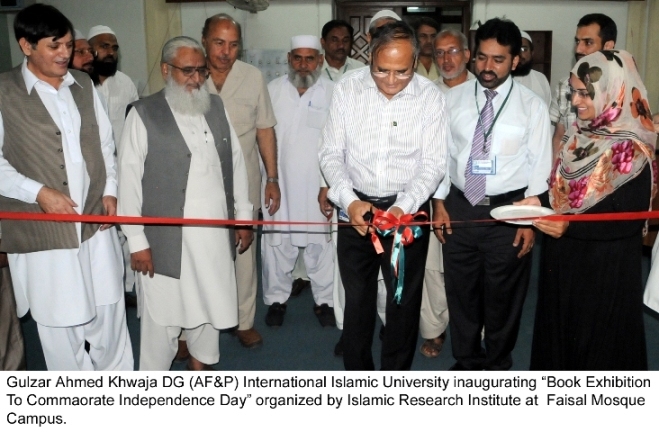 The book exhibition to commemorate Independence Day of Pakistan was inaugurated by the Director General AF&P IIUI Ghulzar Ahmed Khwaja which was organized by Islamic Research Institute (IRI) at Dr. Hameed Ullah Library International Islamic University Islamabad. In exhibition the stalls were decorated with the collection of old and very rare books on Pakistan movement, history and on the struggle of prominent figures of Pakistan movement etc. On the occasion Deputy Director General Dr. Sohail Hassan Chief Librarian Mr. Sher Nowrooz Khan, Principal Librarian Dr. Sajid Mirza and many researchers attended the ceremony. As chief guest in his address Ghulzar Ahmed Khwaja admired the efforts of IRI while saying that such initiatives are highly supportive to highlight and memorise the history of Pakistan and freedom movement. He said the same spirit, passion, dedication, hard work and unity is required to achieve the high destination. Ghulzar Khwja said university is best platform for such activities while vowing to organize a national book exhibition where rare collection on Pakistan could be seen. Earlier, in his opening remarks Dr. Sohail Hassan emphasised to convey the core message of Pakistan movement to new generation is our utmost responsibility. He also said need of the time is to understand and learn from the history of Pakistan. He said our ancestors gave many sacrifices to achieve independence of Pakistan, need of the hour is to convey this long history to young ones. At the end all participant raised hands for the progress, prosperity and stability of Pakistan. President International Islamic University Islamabad (IIUI) Dr. Ahmed Yousif Al-Draiweesh has been nominated for Tamgha-e- Imtiaz which is granted for his untiring efforts in the field of education especially comparative jurisprudence. The government decided to confer Tamgha-e- Imtiaz to Dr. Al-Draiweesh on the occasion of Independence Day August 14 on the recommendation of the Prime Minister which was approved by the President of Pakistan Syed Mamnoon Hussain. Prof. Dr Al-Draiweesh, presently performing his duties as president IIUI since 2012, he is a PhD in Islamic Jurisprudence and owns vast experience of teaching and research in the fields of Islamic Law and Comparative Jurisprudence. He has written more than 50 books and research papers on various important topics including comparative jurisprudence, Islamic economics, human rights and religious extremism. Dr. Al-Draiweesh was also awarded the Imam Mohamed bin Saud Islamic University 1st Excellence Award for best performance while in recognition of his services in research and teaching he was also awarded Al-Madina Al-Munawarah Award. After assuming his position as President IIUI, he has represented the varsity on numerous national and international forums. He has also launched various new departments during his present tenure as president IIUI while he has also played a vital role for various MoUs of IIUI with many national and international universities. Numbers of Pakistani universities have also granted him with awards in recognition of his services in the field of education. Meanwhile, faculty members, administration and students have felicitated Dr Al-Draiweesh for the nomination of the award and they have hoped that under his leadership university would soon make its place among the ranks of leading universities of world. 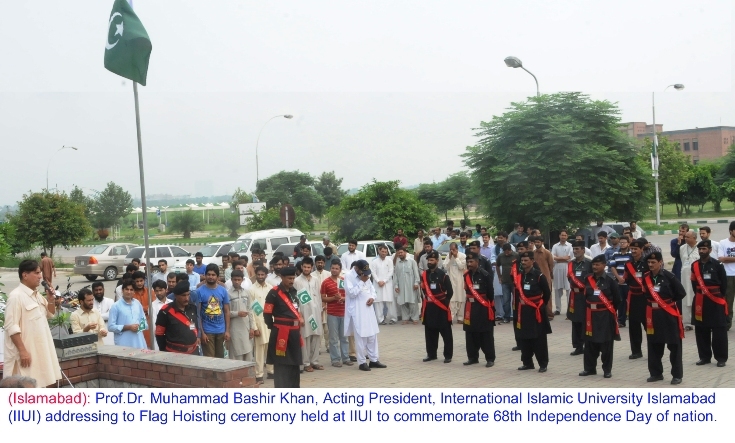 Islamabad: A flag hoisting ceremony, on the occasion of 68th Independence Day, was held at International Islamic University Islamabad (IIUI) where Acting President IIUI Dr. Mohammad Bashir Khan hoisted the national flag. The event was attended by a large number of university officials and employees including Deans, Directors and a large number of students. An organized squad of university guards was also present in the ceremony which offered salute to the national flag amid national anthem. “Pakistan is our recognition, motherland provided us a free life and it must be our top priority to pave the way for its success “said Dr. Bashir while speaking to the flag hoisting ceremony. He added, if nation would be united all lethal aims of enemy powers against the holy land would be foiled. He stressed upon the students to be devoted for the progress of country while terming them as ray of hope for the Muslim Ummah and Pakistan. Acting President of the varsity maintained that independence was bliss and it was a dire need of prevailing circumstances that all Pakistanis should be loyal to the constitution and Islam. He also thanked all for joining the ceremony with zeal of patriotism. 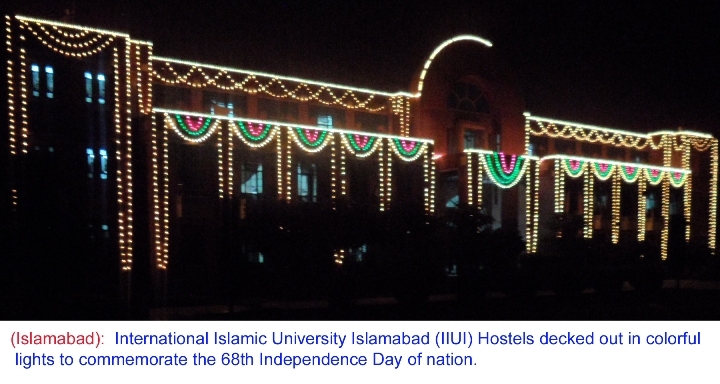 Earlier, IIUI male and female hostels were decked out in colorful lights to commemorate the nation’s 68th Independence Day. 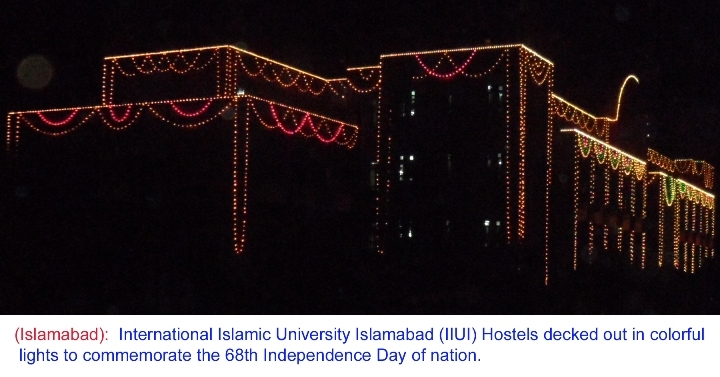 All the four hostel blocks on both sides were decorated with colorful lights while this task was completed in supervision of Director Administration, IIUI hostels provost and other IIUI officers. 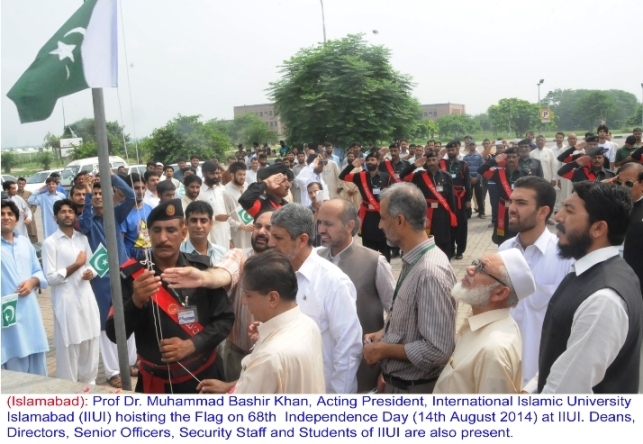 Acting President lauded the efforts and thanked all the concerned officials for decorating the campus. International Islamic University Islamabad (IIUI) has rescheduled its admission tests of all BS, MS PhD programs (Male, Female), which were to be held on 11 to 16 August. According to a notification released by the university administration, admission tests which were to be held on August 11 would now be held on August 20, while tests of 12th August would be held on 21 August. According to revised schedule, tests which were to be held on August 13 would now be held on August 18, admission tests of 15th August would be held on August 19. The tests scheduled on 16th August would now be on August 22. It’s pertinent to mention here the admission tests of PhD, MS in Mathematics, Environmental Sciences, Bio Technology, Bio Informatics and Physics were scheduled on August 11, now would be held on 21 at 10 am. Revised and updated schedule is also available on university website. Click here. Moreover, Female students can seek help from 051-9019327, 9019324 while Male candidates can call on 051-9019567, 9019749 for further information. International Islamic University Islamabad (IIUI) has decided to reschedule its admission tests. Meanwhile, university has also offered BS-Civil Engineering (4years) program for male students for the first time. The program is offered by the department of civil engineering of Faculty of Engineering & Technology of the university. Last date to apply for this program is 20 August while students having HSSC pre-engineering with minimum 60% marks can apply for the said program. Details about the program are also available on university website. Dr Asad Rizvi Assistant Professor, Department of Education International Islamic University, has successfully completed the Certified Quality Professional diploma from Pakistan Institute of Quality Control (PIQC) and has become Certified Quality Professional. Dean Faculty of Social Sciences IIUI, Dr. N B Jumani highly appreciated his achievement and urged him to excel more in professional activities. International Islamic University Islamabad (IIUI) has decided to reschedule its admission tests while applications for admissions to MS program and PhD program will also be provisionally accepted from IIUI students only. According to a notification, admission tests of Faculties of Shariah and Law and Social Sciences tests which were to be held on 13 and 15 August would now be held on 18 and 19 August respectively. Details of the changed schedule have been uploaded on university website www.iiu.edu.pk. Notification also includes that students of International Islamic University Islamabad (IIUI) who will complete their degrees by the end of August can apply for the admission to MS program on provisional basis while those students who have submitted MS thesis and have to undergo the viva voce examination can also apply on provisional basis. Students would have to submit an undertaking that required results would be submitted before September 30, 2014.Last date of acceptance of such forms will be August 05.